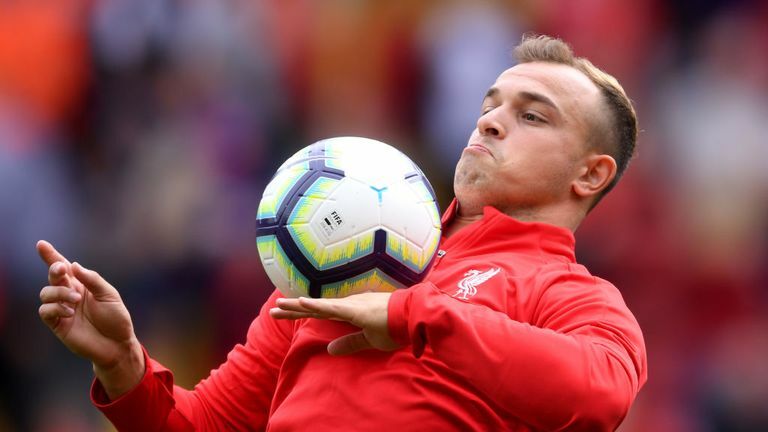 Xherdan Shaqiri is confident top-of-the-table Liverpool can maintain their perfect start to the season, starting with Saturday's Sky Live clash with Tottenham. Liverpool have won their first four fixtures of the season and are about to embark upon a hectic run of games where they play seven times in 23 days, including two matches with Chelsea and Champions League games against Paris Saint-Germain and Napoli. Their first major test of the 2018/19 campaign sees them return to Wembley to take on Tottenham - live on Sky Sports on Saturday lunchtime - where they lost 4-1 last season. Shaqiri said: "I'm looking forward to the game, especially now [because] in the next few weeks we have a lot of games, a lot of good games, difficult games. But we will try to keep our good performances and I hope we can win a lot of games. "We train hard every day. You can see that there is a lot of quality in our team and we are hard-working every day. And competition in football is also good for the players." Shaqiri joined Liverpool from Stoke in a £13m deal over the summer and made an instant impact, scoring a stunning bicycle kick on debut in a 4-1 pre-season thrashing of rivals Manchester United in America.